A group of philosophers sympathetic with the Christian take on things have constructed a complicated and technical account of God beliefs and their source in human cognition known as reformed epistemology. On the view, espoused by Plantinga and Wolterstorff and widely cited and supported in recent years, humans are endowed by God with an innate faculty for sensing God under the right circumstances. This sensus divinitatus is one aspect of a properly functioning cognitive and belief forming system in humans. When it is not corrupted by the invasive noetic effects of sin, this faculty produces a belief in God that is immediate, direct, and non-inferentially justified. That is, a belief in God is properly basic according to the reformed epistemologists. It is not supported by any other independent or more fundamental facts. It cannot be justified on the basis of other beliefs. Rather, it’s axiomatic like the law of non-contradiction or the identity of indiscernibles. The sensus divinitatus will manifest itself in a variety of ways—when you see a sweeping vista of majestic mountaintops, or when your first child is born, or upon pondering the vastness and magnificence of the universe in the night sky. Misinterpreting these feelings of the divine as indicators of a non-Christian God as a Hindu might, or suppressing them and denying that God is manifest in experience are all the by-products of a sinful nature. Doubters, skeptics, and deniers—anyone who doesn’t buy into the Reformed Epistemology picture—have all had their God given God detectors corrupted, co-opted, and distorted by sin. What they need, of course, is the salvation of Jesus to cleanse them of their immorality and to restore the proper function of their belief faculties. Then they will see that they were not right with God before. And then they will have properly basis religious experience of God. So the view has a the tidy way to deal with criticisms and legitimate objections. No objection to the whole scheme can have any merit because it arises from doubt, which is really just wickedness. If you had some experiences that seemed to have profound religious significance, like any normal person you would wonder about alternative explanations. Could this just be a weird artifact of my neurology? I wonder what natural explanation there could be for this strange disassociation? Maybe I ate something bad? The full-blown theistic supernatural explanation is one possibility. But according to Reformed Epistemology any suspicion that you have that it might have been something natural is really the result of your innately evil nature and the taint that sin has placed on your ability to think straight. They position undercuts any objections with an ad hominem attack on the moral character of the questioner. The whole scheme is also clever (and insidious) for inventing a notion of private evidence that shouldn’t be held up for any public scrutiny by someone who has doubts. Once you’re in the special club, you’re provided with “self-authenticating witness of the holy spirit” that gives you perfect, unassailable assurance about your God doctrine no matter what empirical questions or doubts may arise. Ordinarily, evidence is something that is sharable and public. The prosecuting attorney displays the gun that was the murder weapon for everyone in the court, the dentist looks at X-rays, and your mechanic points to the leaking oil around a gasket as evidence that there is a problem. But this special God feeling isn’t like that; it’s just a feeling you have that something’s got to be true, so it can’t be shared with anyone else. Plantinga and some of the people in this camp suggest that the earnest Christian in this situation ought to consider alternative explanations for their experience. Many properly basic beliefs, including the God one presumably, are defeasible. If you have the experiences, and if your conviction that that’s really God your feeling persists after you have scrutinized the belief and reflected on what might be causing it, then you will have a warranted, and true belief that there is a God. Needless to say, the notion of private evidence here is deeply problematic. Imagine an IRS agent telling you that she’s got self-authenticating, private evidence that you can’t see that you owe the government an extra $20,000 tax dollars. Imagine a doctor telling you that she’s got self-authenticating evidence that you’ve got cancer, but the evidence can’t be grasped by anyone who doesn’t already believe it. Or imagine your husband telling you that he’s got special, private, self-authenticating evidence that you’ve been cheating on him. Then suppose furthermore that they assure you that their conclusion is right because they have thought long and hard about it and considered other possibilities. Evidence that's private isn't really evidence at all and a mere feeling that something just must be true, no matter how strong or persistent, is never enough to give it warrant. Here’s a model of human rationality and religious belief that is much more accurate. Humans are endowed by evolution with a remarkably effective set of problem solving skills that can be group loosely under the general heading “reason.” In the right circumstances, our reason allows us to devise complicated and elegant solutions to challenges, make accurate inferences and predictions, and arrive at many well-justified and true beliefs. We manage to cure diseases like polio and land people on the moon. But our cognitive systems are kludgey and imperfect. They’re strapped together with disparate functions and tools that were available at various stages in a long, convoluted evolutionary history. Sometimes they don’t track the truth at all, like when you have an attack of claustrophobia, or you can’t bear to even look at a dish that once made you sick when you were a child. Sometimes our cognitive faculties overreact, mislead, underestimate, or misjudge. Our fancier faculties of reason are also often overwhelmed by a variety of emotional, psychological, and biological forces that erode our ability to reason well and see the truth. One legacy of our evolutionary history appears to be a powerful disposition towards religious belief, experiences, and feelings. Daniel Dennett and Stephen Pinker have recently argued that natural selection may have endowed us with a sort of mind-attribution module. Construing other organisms behavior as the product of the planning and goals within their minds, whether they really have them or not, would be an effective mechanism for anticipating and projecting the behaviors of potential predators and prey. But we’re just built to take it too far and endow everything with a mind—the wind, the ocean, the starry sky, and the world itself. In an earlier post, I called it the Urge—a powerful and seductive need we have to be religious. Completely aside from the factual question of God, it is obvious to anyone who observes humans and their religious activities that we desperately want there to be a God and we will adopt the most contorted gymnastics of reasoning to rationalize the belief. Even if there are some theists with good reasons, there are far more with sloppy, fallacy ridden, biased grounds that they offer for their beliefs. And in lots of these cases, it’s not really the poor reasoning that is offered in defense of someone’s God belief that led them to believe at all. More often it is the case that people have the belief first as a result of the Urge’s infiltration of their consciousness, and then they back fill that conclusion with some superficial reasons. So the Urge is really the dark side of your nature that threatens to corrupt your more noble aspects. It’s the alluring, siren call of religion itself, not sin, that will co-opt reason’s ability to see the world in an accurate light. Staying on the straight and narrow will require resisting the temptation of religion’s easy, emotionally satisfying answers to the biggest metaphysical questions. Living up to your potential to reason clearly and evaluate the evidence objectively demands that you be constantly vigilant against seduction of religion’s false comforts. "Misinterpreting these feelings of the divine as indicators of a non-Christian God as a Hindu might, or suppressing them and denying that God is manifest in experience are all the by-products of a sinful nature." I wasn't aware that he said this about Hindus. Do you remember where you read Plantinga say that? "Imagine an IRS agent telling you that she’s got self-authenticating, private evidence that you can’t see that you owe the government an extra $20,000 tax dollars. Imagine a doctor telling you that she’s got self-authenticating evidence that you’ve got cancer, but the evidence can’t be grasped by anyone who doesn’t already believe it. Or imagine your husband telling you that he’s got special, private, self-authenticating evidence that you’ve been cheating on him." It seems many atheists take something like the self-authenticating view when they claim we should believe in real moral properties, and what they are. The fact is science and our senses is not comprehensive enough basis to explain everything we think is part of reality. "In an earlier post, I called it the Urge—a powerful and seductive need we have to be religious. Completely aside from the factual question of God, it is obvious to anyone who observes humans and their religious activities that we desperately want there to be a God and we will adopt the most contorted gymnastics of reasoning to rationalize the belief. " Replace with "religious" with "moral." And replace "God" with "real moral properties." And you have the same explanation for what many atheists (perhaps even yourself?) believe. I think you do not realize how close Christians and Atheists who are inclined to believe in real moral properties are. "In an earlier post, I called it the Urge—a powerful and seductive need we have to be moral. Completely aside from the factual question of real moral properties, it is obvious to anyone who observes humans and their moral activities that we desperately want there to be a real moral properties and we will adopt the most contorted gymnastics of reasoning to rationalize the belief. " I also tend not to think this is an example of ad hominem. At least not a classic one. I admit it is an interesting question whether it is though. I think your comments against the arguments presented against the defense lawyer and the politician who is paid by a special interest is closer to an Ad Hominem. There you admit the arguments seem fairly detailed but then seem to discount them due to the fact the people are paid to make them. "It seems many atheists take something like the self-authenticating view when they claim we should believe in real moral properties, and what they are... I think you do not realize how close Christians and Atheists who are inclined to believe in real moral properties are." Who are the atheists who believe in self-authenticating moral properties? I've no doubt that there are some atheists who think of moral properties as queer Platonic existants standing outside of the natural causal order, and perhaps their epistemology would have to be similar to that of reformed epistemology. But many atheistic moral objectivists believe that moral properties reduce to or are supervenient upon natural properties. So there many atheists for whom the knowledge of moral properties is reducible to knowledge of the natural order, coupled with usual linguistic knowledge of when and where our terms are applicable. Such ethical naturalists can freely criticize the idea of self-authenticating witness without hypocrisy - your tu quoque misses a large number of atheist critics, who I believe, actually form the vast majority of atheistic moral objectivists. "Who are the atheists who believe in self-authenticating moral properties?" I said "It seems many atheists take something like the self-authenticating view"
So I am not saying they use the exact same terminology. But they are doing something very similar. Peter Singer is one who pretty clearly thinks moral properties are self evident. But really read any atheistic moral realist and you will not see the sort of empirical evidence that proves real moral properties exist, that many atheists demand about God. Naturalistic moral theories claim that morals facts just supervene on natural facts. But they provide no empirical proof of this. They obviously can't provide any empirical evidence that this set of facts has a moral fact supervene because they only acknowledge the moral fact. Whether their is any real morality going on in the case is still completely unproven by any empirical evidence. Instead you will have a different sort of argument. These arguments are often much more similar to the types of arguments we have for God. Yes you are right. There are many atheist philosophers who reject real morals. They can make these sorts of arguments against theists without living by a double standard. Richard Joyce is one such philosopher and you sort of refer to Mackie's queerness argument who would be another. But in rejecting moral realism they have problems of their own. In all of this my point is not to say anyone is irrational. I don't think the atheists who try to justify a real moral basis are irrational. I don't think the atheists who basically reject real morality are irrational. I don't think Christians who accept the Christian morality and defend it are irrational either. My point is that we have precious little information that pertains to very fundamental questions. Namely 1) How should we live our lives? and for whatever we think on that 2)What ultimate basis do we have for believing that? Professor McCormick has an air of certainty and arrogance when addressing Christian beliefs. But I don't see that he has set out his own views on these very basic questions. I think if people are knowledgeable about meta ethics and the problems presented in the literature regarding these questions then they will tend to be much more charitable to others views. I don't think anyone who studies these issues in depth believes that everything in reality works just how they would expect it if their model was true. 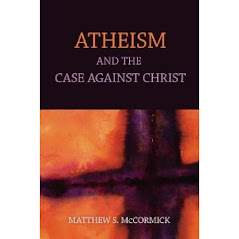 I think one of the major disconnects between Professor McCormick and several other anti-theistic atheists is that their understanding of religion was really focused on certain evangelical beliefs about science. So they tend to think that rejecting religion has to do with rejecting certain anti-science views. However I don't really think most Christians believe that Jesus or Scripture was written to teach science. It was written to teach morality. Christians before they were called Christians were called followers of "the way." So Christianity is very much a way of life not primarily a set of beliefs about science. This is why several Christians look at the back and forth between evangelicals and former evangelicals (who are now anti-theists) and wonder what they are doing. I understand people need to make a living. And some anti-theists might see publishing books/blogs that are divisive and invoke emotional responses is more profitable than arguments that leave that behind for unemotional logic and reason. We all need to make a living. But I don't think that is the proper way to reason through these issues. "But really read any atheistic moral realist and you will not see the sort of empirical evidence that proves real moral properties exist, that many atheists demand about God." Atheistic moral realists not providing empirical evidence of their view is not the same as their taking a self-authenticating view of moral properties. You're not entitled to draw that conclusion on the basis of what you haven't found in what you've read of them. And in fact, your demand for empirical evidence is odd. The main work to do here is for them to show that there is no difference in moral properties without a difference also in natural properties, and that therefore moral properties can be 'read-off' from all the familair natural features of a situation. But that is conceptual work. What empirical investigation there is follows on from there, and is of the unproblematic kind - identifying ordinary natural properties which the moral properties are supposed to reduce to or supervene on. "Richard Joyce is one such philosopher and you sort of refer to Mackie's queerness argument who would be another." Interesting that you mention Joyce. He claims that a moral prescription gives a moral agent a reason-for-action so powerful, it overrides any practical considerations the agent might have against the prescribed behavior and renders disobedience irrational. Many atheistic moral realists reject this view - they then need to explain what is seductive about it, even if it is false, but they do not have the burden of showing that such moral properties exist as could determine certain actions as rationally required regardless of the desires or beliefs a moral agent has. "I think if people are knowledgeable about meta ethics and the problems presented in the literature regarding these questions then they will tend to be much more charitable to others views. I don't think anyone who studies these issues in depth believes that everything in reality works just how they would expect it if their model was true. " Yes, meta-ethics is hard, and I agree that grappling with it does and should instill epistemic humility - but only about meta-ethical issues, not necessarily about any other field of inquiry. I don't see why the Professor should be less forceful in his arguments for atheism just because he lacks decisive arguments on a matter he considers to be unrelated. "However I don't really think most Christians believe that Jesus or Scripture was written to teach science. It was written to teach morality." Reading this makes me wonder what then is special in the Christian worldview, as you see it. Is the bible then no different from an ethical treatise, having no greater authority than the strength of its arguments and the indubitability of its axioms? If so, then it is at best a minor tract, overly long and full of details which are irrelevant to its proper purpose, and probably not worth the time of non-specialists. No, I don't think this is what Christians believe. They believe that the Bible is special, and this can only be because it contains historical facts which describe the role of the supernatural in human affairs. If the morality found therein is worthy of our attention it is because it is endorsed by a supernatural authority, who is wiser and more powerful than ourselves. But these supposed historical facts disagree with the picture of reality drawn by science, and adherence to them requires us to flout the epistemic principles which scientists have settled on in coming to their conclusions about what is true. So, there really is a conflict here, even if the moderate Christian is not and does not want to be an active participator. Thanks for your response. But I would just point out that you are intent on rephrasing what I said in a misleading way. If you just focus on what I actually say and then try to address that I think our conversation will be more fruitful. "It seems many atheists take something like the sellf-authenticating view when they claim we should believe in real moral properties, and what they are..."
"I said "It seems many atheists take something like the self-authenticating view"
So I am not saying they use the exact same terminology. But they are doing something very similar." "Atheistic moral realists not providing empirical evidence of their view is not the same as their taking a self-authenticating view of moral properties..."
So again I am not saying it is the same. But it is *something like it*. Both groups claim their view can be rationally held without any empirical evidence supporting it. I mentioned Peter Singer just as an example and you ignored that. There are, of course, several others. Your ignorance of their existence and writings does not mean they are not many in number. Russ Shafer-landau is another moral realist who is also a non naturalist. He happens to https://sites.google.com/site/shaferlandau/homeMichael Huemer and other who subscribe to moral Intuitionism provide many other examples. Moral intuitionism is a view that although moral facts are at based not inferred from evidence they nevertheless can be reliable and are epistemologically legitimate. I could go on but you also could just read any introduction to metaethics and you will see that there is no real ground to think vast majority of atheistic moral realists are moral naturalists like you suggest. Thats not to say that Moral naturalism doesn't have major problems either. It does. I say I think the bible and Jesus teach not science but morality. I think the vast majority of Christians would agree with me. But then you go on to mischaracterize what I said into something that I agree most Christians would not agree with. I wouldn't agree with it either! Is that really getting us anywhere? If you address the comments I actually make instead of your misrepresentations of what I said I think the conversation might be clearer and we will be more likely to get somewhere. Richard Joyce is an error theorist when it comes to morals. He might think our *beliefs* about morals are strong motivators. But he thinks all claims about things being morally wrong or morally justified are false, in that they claim to correspond with reality but in fact do not. These issues are complicated because many people are trying to save morality and let go of God. You want more contorted gymnastics? Keeping morality without God can deliver on the moral front we also have "quasi realists." Yep another meta-ethical view. Again my point is not to say the work these philosophers do is irrational. Not at all. "Yes, meta-ethics is hard, and I agree that grappling with it does and should instill epistemic humility - but only about meta-ethical issues, not necessarily about any other field of inquiry. I don't see why the Professor should be less forceful in his arguments for atheism just because he lacks decisive arguments on a matter he considers to be unrelated. " Well Christianity and meta-ethics are not unrelated. The professor might think they are and I even gave an explanation of why he thinks they are. That is his exposure to Christianity was through a small sect of evangelicalism that emphasized the supposed scientific claims of christianity versus the moral claims of Christianity much more than the majority of other Christians. But regardless if he wants to criticize religious thinkers for accepting non-inferential beliefs but turn a blind eye to his fellow atheist thinkers who do the same this is a double standard. We see this double standard on this blog in just about every post. Either take your epistemic standards and apply them equally to theists and atheists alike or admit you are just ranting about your biased views. I happen to need the comforts that Christ provides me in His promises. If they are one day proven to have been false…then so be it. But for now, I do take great comfort in believing that because He was raised from the dead…so will I be. There is something which we all know, and it was born after the existence of the earth, namely: life. Our scientists state that earth was too hot (and some of them say it was too cold) for any kind of life to exist on it. It took the earth millions of years to become a suitable place for life. Life, therefore, is, undoubtedly, a newborn. Science, however, tells us that life does not originate from non-living being. Pasteur's experiment, which took place in the 19th century, is still standing. Through his sterilized soup, he proved beyond any doubt that life does not originate from inanimate material. The scientists of today are still unable to disprove his conclusion. The earth, along with its atmosphere, at the time of its formation was sterile and unproductive. Transforming the inanimate materials, such as carbon, hydrogen, nitrogen, calcium, and iron into a living being could not, therefore, be done through a natural process. It must have been done miraculously. This means that the existence of life on this planet is a shining evidence on the existence of an Intelligent, Supernatural Designer.